With more than 300 recorded bird species it won’t come as a surprise to learn that St. Marks NWR is regarded as one of the best birding sites in Florida. Stop at the visitor center for a map and check the sightings log; loaner optics are available. From here head to the helipad, which is good for wintering Henslow’s Sparrow; East River Pool is spectacular; look for wintering Vermilion Flycatchers in the roadside trees, and at dusk, big flocks of waders flyover; Stoney Bayou Pool and the Mounds Pools hold 20+ species of waterfowl in winter and 20+ species of shorebird during migration. Stoney Bayou #2 and Mounds Pool #3 provide the best opportunity to see American Black Ducks in Florida (December to February is best). In winter, the refuge offers tram tours around the impoundments. 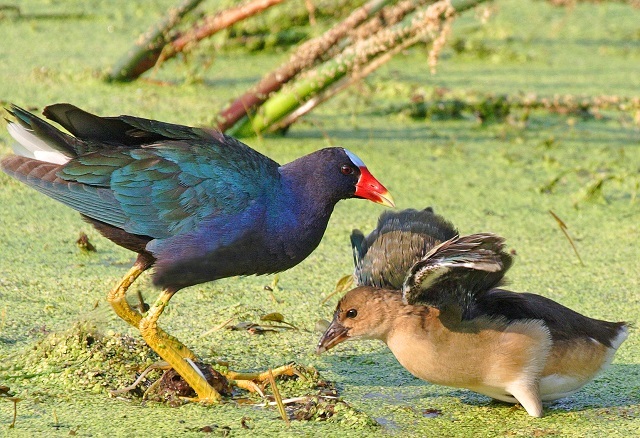 Headquarters Pond is good for Purple Gallinule. The Mounds Trail around Tower Pond is very good for migrant songbirds in spring. In April and May visit Tower Pool 2-3 hours before high tide for spectacular views of shorebirds; rarities like Hudsonian Godwit have been recorded and Gull-billed Terns are regular in early May. At the road’s terminus at the lighthouse, look for wintering waterbirds. Red-throated Loons are recorded annually. Lighthouse pond is good for wintering ducks including Canvasback. Butterfly viewing is best here in fall, especially September and October. Monarch butterflies congregate on their fall migration to Mexico; a Monarch festival is held in October. Along Lighthouse Dr., keep your eyes open for American Alligators, Bobcats, River Otters and Florida Black Bears.